Harness your brain power to solve puzzles and complete quests! All aboard! 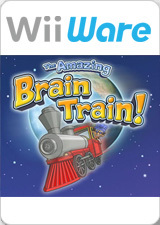 Power up your intellect and embark on an epic quest aboard The Amazing Brain Train! Fueled by your mental energy, Professor Fizzwizzle's Brain Train will take you on a brain-boosting adventure! Put your mighty mind to the test and see how far you can go! The graph below charts the compatibility with The Amazing Brain Train! since Dolphin's 2.0 release, listing revisions only where a compatibility change occurred. This page was last edited on 4 March 2017, at 08:39.